Although initially surprised by the idea of CDs designed for use while playing tabletop RPGs, I must admit that it’s not a bad idea. Remember, the whole point of a role playing game is to immerse yourself in another world and what better way to do that than through music? That’s why music and sound effects are so important in haunted attractions! I first became aware of the concept from a friend, who owned an “Introduction to Dungeons and Dragons”-type set that came with a CD. Apparently, it contained both music, sound effects and characters talking and my friend mainly used it to laugh at the goofy voices. Having never heard of any other such CDs since then, I assumed it was a one-off failed experiment. So imagine my surprise when I learned that the Midnight Syndicate released an official CD for use with Dungeons and Dragons in 2003! As it turns out, enough RPG fans were buying their CDs for use in gaming sessions to attract the Syndicate’s attention. This led to the band setting up booths at gaming conventions, where they got in touch with the company that owns Dungeons and Dragons and, well, you know the rest. Interestingly enough, neither this nor the first CD I mentioned where the first musical projects associated with role playing games, as shown at the following Wikipedia notations. But they aren’t the only ones producing such CDs. Research reveals that soundtrack CDs are available for both the Cybernet RPG and the German edition of Little Fears. Spaceship Zero also inspired a CD, but it does not seem intended for use while gaming. The same band behind that release, The Darkest of the Hillside Thickets, also produced a compilation CD for use with the d20 version of Call of Cthulhu. But what about music designed for fantasy adventures using any gaming system? That’s where Dronolan’s Tower comes in. Founded in 2006 by David Allen Young in Studio City, California, the motto of Dronolan’s Tower is “Music By Gamers For Gamers.” With the help of a choir and Hollywood studio orchestra, Dronolan’s Tower released Legends of Kitholan Vol. 1: Tales of the Long Forgotten in 2007 to immediate acclaim. The album netted three awards in that year’s Radio Rivendell Fantasy Awards: “Best Fantasy Album,” “Best Unsigned Artist,” and “Best Song by an Unsigned Artist.” This was followed up in 2008 with Journeys in Darkness Vol. 1: Those Who Dwell Beneath, which focuses on dungeon crawls and darker themes than the general fantasy-based Legends of Kitholan. So if gamers can use spooky ambient music CDs for use in games, then why can’t Halloween enthusiasts and haunters do the reverse? The light percussion of “Prelude – The Hand of Fate” leads to bells and heavy, epic fantasy-type backing music. The drums and horns toward the end add to the effect and give this track the feel of the opening credits sequence of a movie. In “Tomb of the Cursed,” soft, serious string work gets varied when the light drum pounds get involved. But as the pounding gets louder, the music gets scarier for awhile. Soft piano, deep, low horns and some brief male chanting give it a more mournful tone until the soft “fantasy touches” lightens things up a bit towards the end. The opening low strings of “City of the Ancients” transition well from the last song and have an epic, but subdued mood. Violins provide a lighter sense of ethereal unease via at times, while there is a spookier, heavier feel at others (especially near the end). “Where Men Dare Not Tread” starts with “tip toe”-like pianos and low, heavy horns that gradually build in volume. Drums pick things up, as do horns. It’s as if you have been spotted and are now on the run. Things slow down near the end, but the track still retains a feel of danger. In fact, the use of drums there makes me think a fight has broken out. In “Those Who Dwell Beneath,” low string work builds somewhat in intensity and is occasionally joined by drums. It’s very moody and effective until the drums build up and team with deep horns to provide a feeling of danger and menace. “Glories Lost” has a feel of elegant sadness thanks to the softish, medium string work but once the drums come in and the violin work varies, you know there’s more than just sadness here. Horns and the return of musical tip-toeing are a nice touch. “Mysteries of the Deep” provides a low sense of danger in its soft intro, then soft horns, piano and plucking strings give it a more laid back feel. I think that pretty much every track on the disc is all well-suited toward creating the sense of exploring, but this one works especially well. “O Darkest Knight” is the spookiest of the tracks, thanks to the evil whispers, chanting and sinister strings that open it. However, it adopts adventurous feel not long after and the violins get a real chance to shine here. The evil touches come back later, though. “Realm of Shadow” has a soft, low intro that sets tone for rest of track. The mix of strings, drums and what seems to be soft chanting in “Escape from the Depths” make for rousing opening. The drums are very pounding here, although the music later becomes slower (but is still energetic). I can easily imagine flight from some underground realm, fighting at some times and hiding at others. Writer/composer David Allen Young has put together an amazing CD that could easily be the soundtrack for a big budget, major Hollywood motion picture. 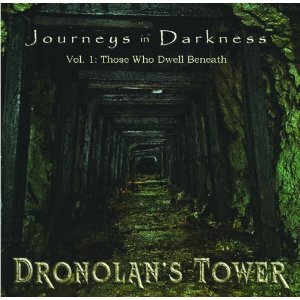 Although darker in nature than the first release by Dronolan’s Tower, this is not a scarefest. Instead, the music immediate brings fantasy films like the Harry Potter and Lord of the Rings series to mind and also creates sense of guarded wonder with some elements of chills and excitement…the exact same emotions felt by countless children on Halloween upon finding a house that has gone all-out in its choice of decorations. So if you have a castle or wizard-themed setup and want music that will draw everyone into the mood of the realm you have created without overwhelming the little ones, definitely use this album. Special thanks to Dronolan’s Tower for the review copy!